Phil Pearthree examining columnar basalt, Verde River headwaters. Tucson. 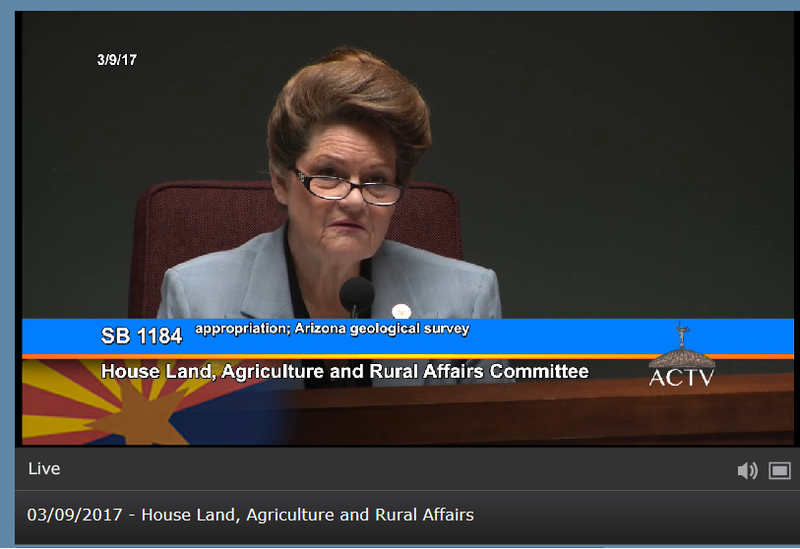 Senate Bill 1184 (SB1184), introduced by Senator Gail Griffin, would provide a state appropriation to fund the AZGS at the same level we were funded as a separate state agency. 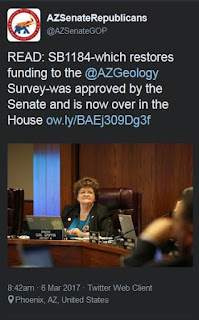 Obtaining designated state funding is crucial to the ability of the AZGS to fulfill its state-mandated duties, as well as to provide matching resources for many external funding sources, such as the US Geological Survey’s StateMap Program that requires a dollar-for-dollar match and produces four to six geologic maps annually; maps utilized by county, state, and federal decision makers, city and county planning teams, the mining industry, flood management and the emergency management, realtors and contractors, and the Arizona public, among others. SB1184 passed the Senate by a vote of 28-2 on Feb. 23 and was sent over to the House, where it was assigned to the Land, Agriculture, and Rural Areas Committee. Last week the bill successfully passed the committee by a vote of 7-0. Senator Griffin and Steve Trussell, Executive Director of the Arizona Rock Products Association, gave great testimony on our behalf. The House Appropriations Committee will be the next to consider the bill on Wed. 3/15 at 2pm. Senate Bill SB 1415, which would permanently transfer the former Arizona Mining & Mineral Museum to the UA as the repurposed Arizona Mining, Mineral and Natural Resources Education Museum, was also passed by the Senate by a vote of 30-0 in late February. It is scheduled to be heard in the Energy, Environment and Natural Resources Committee next Tuesday 3/14 at 2pm. We greatly appreciate the support of the geologic community and other stakeholders and friends of the AZGS as we make our way forward in the University of Arizona. In case you are inclined to express your opinion about these bills, you can register your support on-line via the AZ Legislature ‘Request to Speak’ form or contact your legislators. 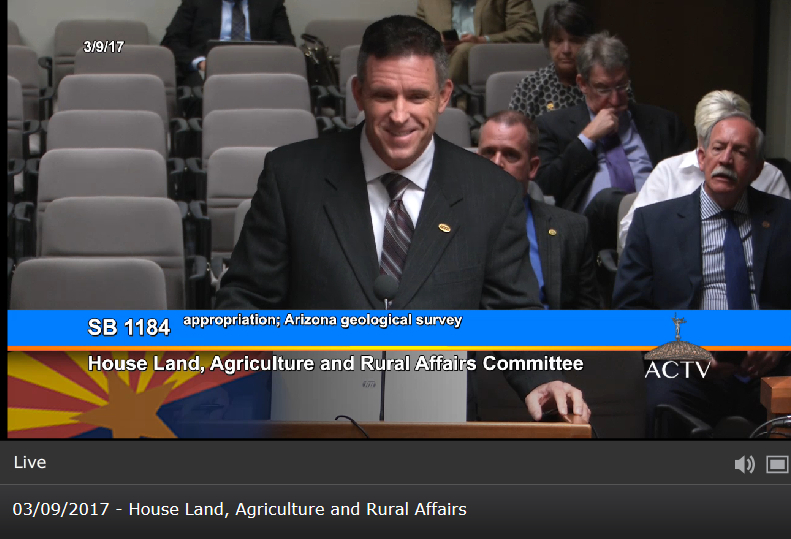 The Arizona House Land, Agriculture and Rural Affairs Committee passed SB 1184, AZGS' funding bill, 7-0 this morning. Senator Griffin introduced and defended the bill. Arizona Rock Products Association's executive director, Steve Trussell, was on hand to voice his support. AZGS had three other supporters at the Capitol today. The objective of SB1184 is to re-establish AZGS' state-allocated funds at the 2016 level of $941,000. There are more hurdles to leap, but the Senate and now the House appear to be in full support of the bill and in re-establishing funding for the Survey. 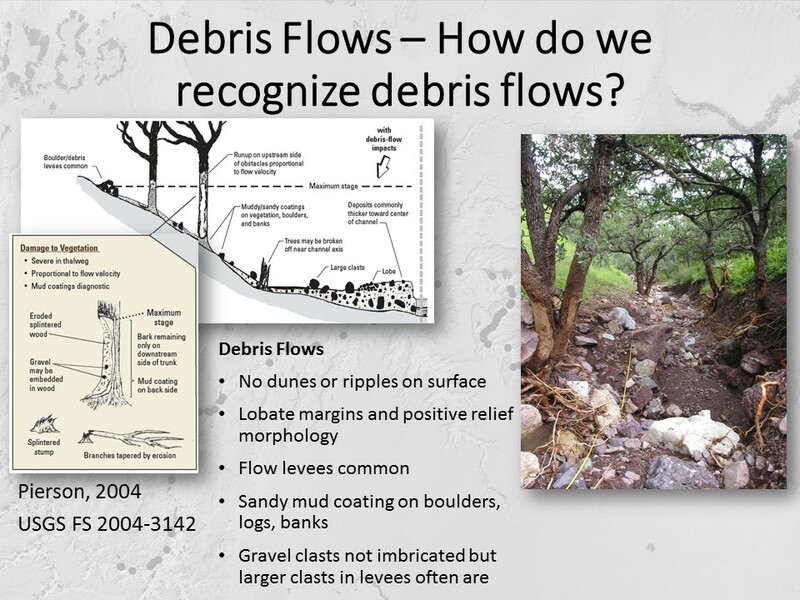 Graphic illustrating debris flow deposit features. Not surprisingly, landslides, slumps and earth fissures can disrupt water management systems, thereby hampering the work of floodplain managers. This Tuesday and Wednesday (3/7-3/8/2017), the Mohave County Public Works Department hosts a training session on geomorphology for floodplain managers in Kingman, Arizona. Phil Pearthree, AZGS Director and State Geologist, will deliberate on earth fissures, geochronology, landslides and debris flows. He'll also address floodplain manager’s questions regarding the potential impact of geologic processes on their constituents. AZGS’s Ann Youberg and Joe Cook tag-teamed training sessions at last fall’s floodplain management workshop. 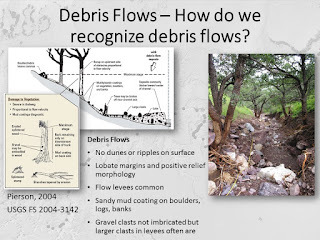 This spring, Joe Cook guides Pima County floodplain managers on a tour through the Santa Catalina Mountains examining debris flows. In January 2017, Sen. Griffin introduced SB1184 refunding the Survey at 2016 levels of $941,000. The Senate supported the bill 28 to 2, sending it forward into the Arizona House of Representatives. On Thursday (9 March) at 10:00 a.m., the House Lands, Agriculture and Rural Affairs Committee, chaired by Representative Barton of District 6, will hear the bill. As reported in the Daily Star, Sen. Griffin is calling on state government to put money back in the budget, for ‘an important state agency that is world-renowned for what they do.’ ‘The state's mining and real estate organizations supported the bill, along with geological associations.’, according to the Daily Star. With university support, AZGS is moving forward in refilling positions in web development (1/2 time), programming (1/2 time), and geo-infomatics (full time). 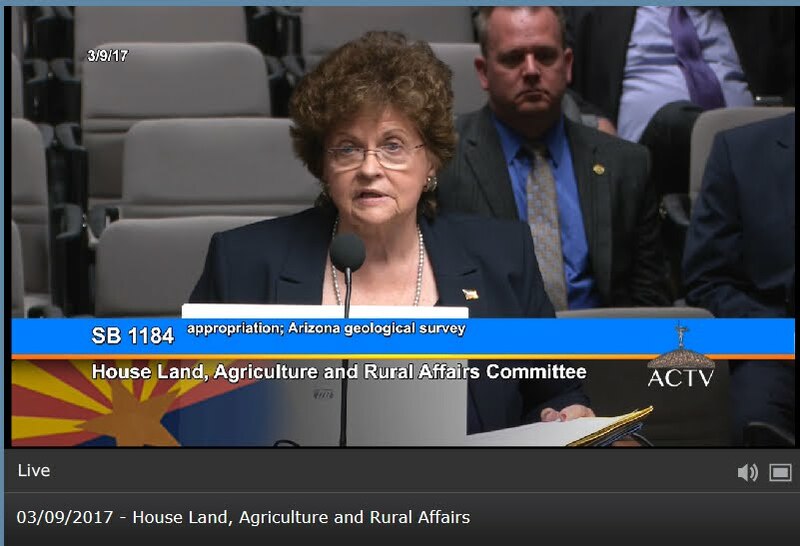 We thank Sen. Griffin for her continued support of the Survey and its mission - to encourage and promote sustainable use of Arizona’s mineral resources and to identify geologic hazards that threaten people and property. Image: AZSenate Republicans tweet (3/6/2017) showing Sen Gail Griffin in session at the Arizona Senate.